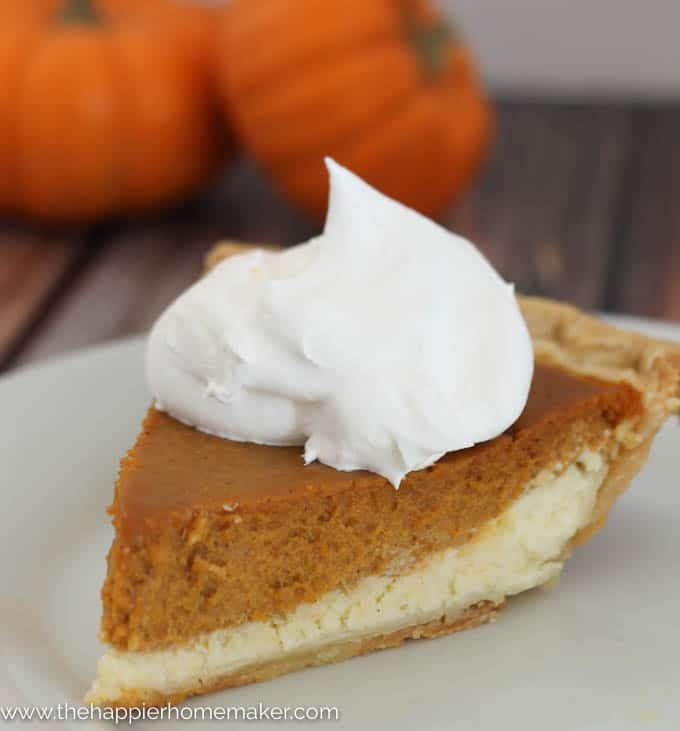 There is not much in life that can beat a good pumpkin pie, unless that pie is combine with my other favorite dessert-cheesecake!! I shared a traditional Pumpkin Cheesecake recipe a couple of years ago but this year I put a different twist on it by layering the flavors rather than combining them. 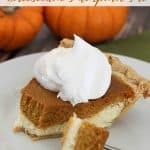 The result is this amazing Layered Cheesecake Pumpkin Pie that will knock your socks off!! Preheat oven to 350 degrees. In a small bowl combine cream cheese and sugar on low speed until well blended. Add 1 egg and continue to mix 2 minutes. Set aside. In another bowl combine pumpkin, half and half, brown sugar, spices, and 1 egg for 1 minute on low speed until blended. 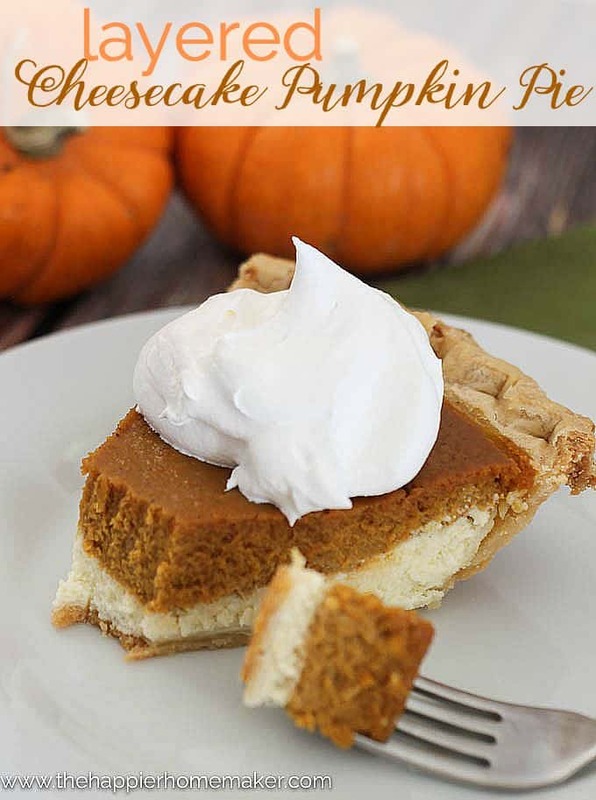 Spread cream cheese mixture onto frozen pie crust. Spoon pumpkin mixture over top of cream cheese. Bake for 70 minutes or until set (when a knife inserted in the center comes out clean.) Cool 30 minutes then refrigerate at least 4 hours prior to serving. Serve with whipped cream if desired. Store in refrigerator. Please excuse my lack of picture of the full pie-a certain 8 year old thought it was super funny to take a bite right out of the middle before I took pictures! Please let me know what you think of the recipe in the comments!! I love hearing your feedback! 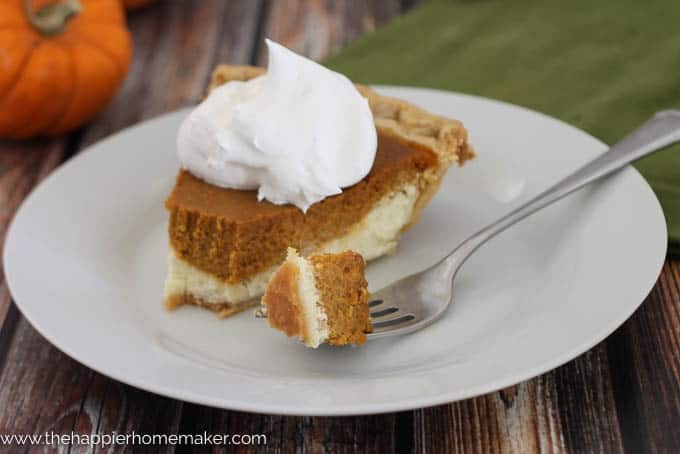 Combine two of your favorite desserts in this easy to prepare Layered Cheesecake Pumpkin Pie! Perfect for Thanksgiving or year round! In a small bowl combine cream cheese and sugar on low speed until well blended. Add 1 egg and continue to mix 2 minutes. Set aside. In another bowl combine pumpkin, half and half, brown sugar, spices, and 1 egg for 1 minute on low speed until blended. Spread cream cheese mixture onto frozen pie crust. Spoon pumpkin mixture over top of cream cheese. Serve with whipped cream if desired. Store in refrigerator. Yum! Question- could I do this without the crust? In a 8×8 square dish? Do you have to use a frozen pie crust? Would fresh work? I make my own. Or should I freeze the pie crust before filling? Thanks.